last Tuesday at the Athenee Palace Hilton Bucharest. CUNDALL Engineering’s David Clark did a fantastic job explaining the benefits of green buildings and how they are changing the Facilities Management profession. As ROFMA’s mission is to professionalize their industry and align their members with important trends in the industry, we were eager to partner with them. As we strongly believe that Facilities Managers who are interested in building their capabilities in Green Building belong in both organizations, we announced that RoGBC members who join ROFMA by March 31, 2010 will receive a 20% reduction on ROFMA’s membership fees. We are glad to see their enthusiasm for “Going Green” and welcome their knowledge and capabilities in the Facilities Management sector. Interested persons should visit their website and contact ROFMA’s Executive Director Cristian Vasiliu. 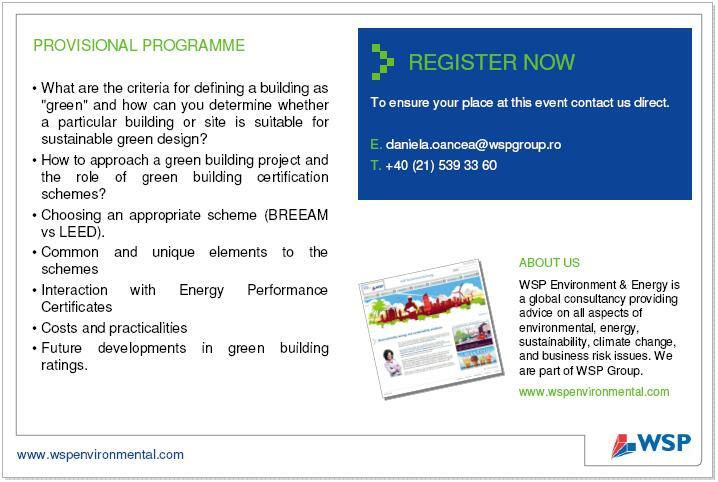 Founder member of the RoGBC, WSP Group SRL, is hosting a complementary briefing to RoGBC members where the various aspects of certifying a “Green Building” will be discussed. In addition to presentations and interactive sessions, attendees will have the opportunity to question members of WSP’s green buildings design and assessment team over lunch. *Note: Seats are limited, so please book in advance. This January, the RoGBC suggests a sustainable New Year resolution: turning your home into a greener one. To prove that this is a feasible target, we invite you to take example form one of our very active members: Perry Zizzi, partner within Badea Clifford Chance, who achieved a Class A certificate for his home. Lestat Monroe, the person behind the retrofitting of the home, as well as Ila Teodorescu, the auditor who rated the energy efficiency of the house agreed to explain the motivation, method and consequences of rating one’s home. RoGBC: Why did you get your building audited? 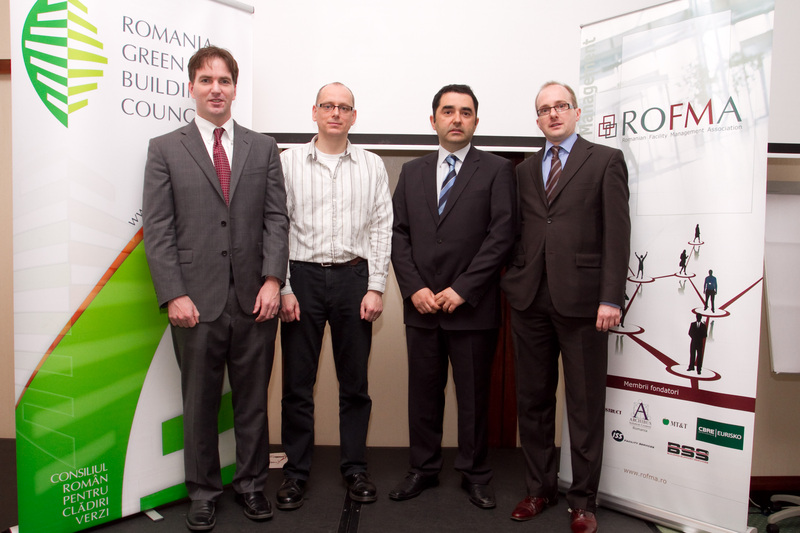 Lestat Monroe: We believe in setting an example that green construction is feasible and desirable in Romania. There is also the personal conviction that we must green our homes and workplaces to ensure sustainability. Finally, there is no doubt that a building certified as energy efficient will — at least in the medium term — be more valuable than a building that is not. RoGBC: What were your expectations and experience with the process? L.M. : There is very little information on this, available to the average person. It is difficult to find companies that know the range of options available and that have the requisite expertise to properly install photovoltaic cells and other enhancements. We did all the research and educated ourselves, but we were still often told that nobody in Romania builds green, it is too expensive, etc. 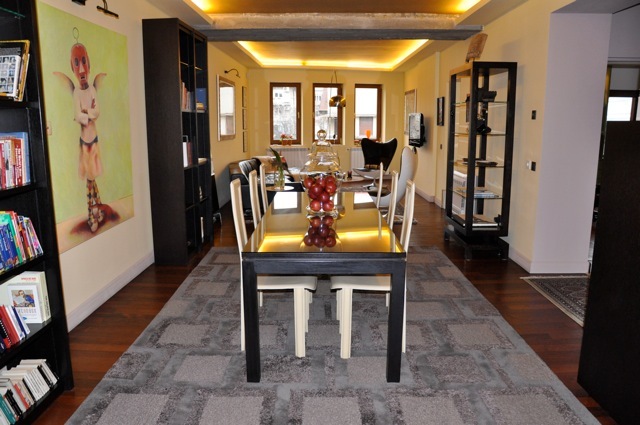 Because we made improvements that are not generally used in Romania, we expected that the building would get high marks. RoGBC: Was the result as high as the expectations? L.M. : The building earned the highest rating. It was gratifying to see so soon a pay-off from all the planning and extra effort to educate contractors and search for materials. RoGBC: Will you be taking any next steps? L.M. : We will continue to monitor technological developments and current trends in an effort to maintain an optimal mix of energy-saving features in the building. RoGBC: Where is the most room for improvement for Romanian homes/buildings? The biggest ROI? L.M. : It’s simple: windows need to be closed when the heat or the air conditioning is on. If it is too hot, turn down the heat — don’t open the window. Same if it is too cold when the air conditioning is operating. This behavior is among the most wasteful and inefficient! Besides that, buildings could be better insulated, energy saving bulbs could be used, lights could be put on sensors to turn off automatically when a room is empty and water saving toilets could be used. RoGBC: How was the process seen from the auditor’s point of view? Ila Teodorescu: At present, a building is considered to be an organism undergoing permanent evolution, needing to be rehabilitated after a certain time and modernized in order to fit the requirements claimed by the owner, at a specific level. RoGBC: Where do you think is the most room for improvement in Romanian homes? I.T. : Improving or increasing energy efficiency has to start as a matter of educating the building users in the spirit of energy saving and has to go through affordable interventions, to energy auditing and finally receiving recommendations for technological improvements of the building. The building envelope is the area where most improvements can be done in order to rehabilitate the building. It is the biggest source of ROI as well. 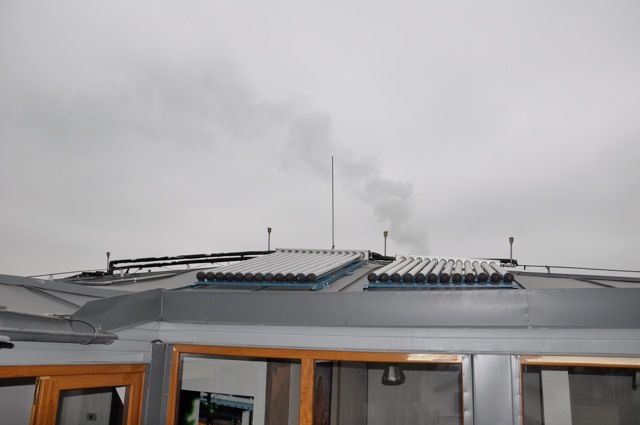 We have to bear in mind the fact that the costs associated with the thermal rehabilitation of a building are lower than the costs of installing a complementary thermal energy capacity. Common sense and increasingly efficient technology are the two elements driving the future of responsible building. Ignoring either of the two can delay development and have a negative economic impact. As in any other field, it is the awareness of the possibilities to improve that can transform our reality in a way that could pleasantly surprise even the most skeptical. S. Richard Fedrizzi, Founding Chairman, President & CEO of the U.S. Green Building Council was invited to the World Economic Forum’s Davos Conference highlighting the importance energy efficiency, sustainable construction, and green jobs are taking in the political and business leaders’ agenda for 2010. Click here for a USGBC press release about the Davos event. We are very fortunate to have Mr. Fedrizzi join us as a key note speaker in April’s Build Green CEE conference – organized by the Romania, Polish, and Hungary GBCs and in partnership with many GBCs throughout Europe.